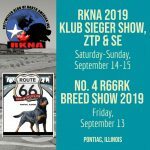 Champions › Rottweiler Klub of North America Inc.
RKNA ELITE Champion award revised in 2016 to match the requirements from the ADRK for RKNA member dogs to enter the ADRK Klub Sieger. B. The 4 points must be earned under 3 different judges. C. The points must be earned during a period greater than 12 months. D. The dog must be entered in the adult classes. Applications for the RKNA Championship titles may be made to the Community Affairs Committee. Copies of proof of points must be included. To attain the RKNA Championship title, a member’s dog must achieve five (5) total points. One point must be earned from a V1 rating at a RKNA show from the adult classes. A. 1 point earned for each V1 rating awarded from the youth classes. B. The points must be earned under 2 different judges.